Coverage: Live commentary on BBC Radio Scotland, BBC Radio 5 live and sports extra, plus live text commentary on every match on the BBC Sport website. 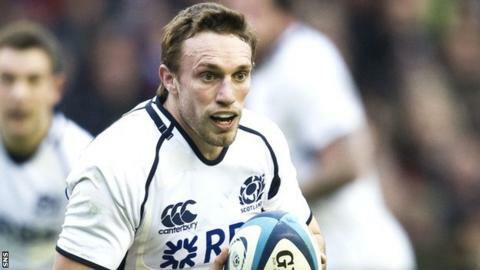 Former Scotland captain Mike Blair has been writing a column for the BBC Sport website as Scotland prepare for the Rugby World Cup. Ahead of the final warm-up game against France on Saturday evening, the Glasgow Warriors scrum-half will answer the best questions you submit. Among the subjects you may care to raise are head coach Vern Cotter's choice of players in his squad, Scotland's chances in the showpiece tournament in England, tactics, or questions about Mike's own experience with the national team. If you'd like to submit a question, please Tweet @bbcsportscot or post a question on our Facebook page by 20:00 BST on Thursday and we will publish Mike's responses on Friday. Hookers: Fraser Brown (Glasgow Warriors), Ross Ford (Edinburgh Rugby), Stuart McInally (Edinburgh Rugby). Props: Alasdair Dickinson (Edinburgh Rugby), Ryan Grant (Glasgow Warriors), Gordon Reid (Glasgow Warriors), Willem Nel (Edinburgh Rugby), Jon Welsh (Newcastle Falcons). Locks: Grant Gilchrist (Edinburgh Rugby), Jonny Gray (Glasgow Warriors), Richie Gray (Castres), Tim Swinson (Glasgow Warriors). Back-rowers: David Denton (Edinburgh Rugby), John Hardie (Unattached), Josh Strauss (Glasgow Warriors), Alasdair Strokosch (Perpignan), Ryan Wilson (Glasgow Warriors). Back three: Stuart Hogg (Glasgow Warriors), Sean Lamont (Glasgow Warriors), Sean Maitland (London Irish), Tommy Seymour (Glasgow Warriors), Tim Visser (Harlequins). Centres: Mark Bennett (Glasgow Warriors), Peter Horne (Glasgow Warriors), Matt Scott (Edinburgh Rugby), Richie Vernon (Glasgow Warriors). Fly-halves: Finn Russell (Glasgow Warriors), Duncan Weir (Glasgow Warriors). Scrum-halves: Sam Hidalgo-Clyne (Edinburgh Rugby), Greig Laidlaw (Gloucester), Henry Pyrgos (Glasgow Warriors).